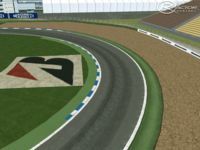 There are currently no setups for Hockenheim Classic 2001 Layout. Add a Setup. Good work for putting in the effort. Shame this is the most boring F1 track of all time! there is an loading error: can´t read hockenheim_rfe.mas file. Any help? Track looks pretty close to onboard video but what's up with the trees in this one? So bad they're distracting. That said, WCP have released some great tracks and this is one historic version I've never seen. Stadium section looks a little off, but have to look again.